As regular readers of my blog know, we've had a rough month or so around here. In the midst of a string of crises a few weeks ago, my husband and I were in desperate need of a light, funny movie to escape into, so we chose Game Night from Redbox. To be clear, when I first saw the previews and ads for this movie in the winter, I did not plan to see it - I thought it looked kind of stupid. Then, I heard a good review of it from my friends at Pop Culture Happy Hour, one of my favorite podcasts, so I decided to give it a try. This thriller comedy turned out to be a lot of fun, surprising, and very funny. Jason Bateman and Rachel McAdams star as Max and Annie, a married couple who are highly competitive and love to play games. They often host game nights for their friends. On this particular night, they've invited two other couples over for games and worked hard to hide their game night preparations from their creepy neighbor, Gary (played by Jesse Plemons). Max's super-successful brother, Brooks (played by Kyle Chandler) shows up. As usual, Brooks one-ups Max and hosts another game night at his expensive house the following weekend, and explains that he's booked a special surprise for the night - a murder mystery put on by a local company. Soon, a fake FBI agent shows up at the house to kick off the evening's fun - he explains that one of the guests will be kidnapped and the others have to follow the clues to find him or her. In the midst of his explanation, two thugs show up and violently take Brooks away. Max, Annie, and their friends assume this is the fake kidnapping and set off to follow the clues. What they don't know is that Brooks was really kidnapped by some serious criminals and is involved with some scary stuff. What follows is a comedy of errors, as the couples set off to find Brooks, not realizing they are following real thugs carrying real guns. As you can imagine, this leads to plenty of suspense and lots of laughs. Though I expected the sort of slapstick, silly comedy I don't really enjoy, this movie turned out to be really, truly funny and quite clever in a unique blend of thriller and comedy. Bateman and McAdams are excellent in these roles and play off each other perfectly. Their acting and the writing are absolutely hilarious, but it is also a suspenseful thriller with plenty of surprising twists along the way to an ending we never saw coming. All in all, it was exactly what we needed that weekend: a lot of laughs and a lot of fun. 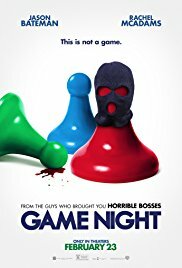 Game Night is currently out on DVD and available streaming on Amazon.